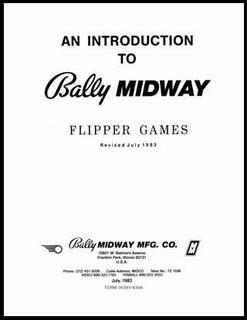 "Introduction to Bally Flipper Games - 1983 - Original" has been added to your cart. 1983 Original 73 page comb bound, 8.5" x 11" novice level instruction book. Good condition. Theory of operation for electromechanical pinball machines. Contains instructions on servicing and troubleshooting. 9 page appendix for troubleshooting Bally solid state games.